At least one official in The Villages is wondering how new driverless taxis will negotiate the gated entrances here in Florida’s Friendliest Hometown. Community Development District 8 Supervisor Dennis Hayes raised the issue at Monday’s Project Wide Advisory Committee meeting. 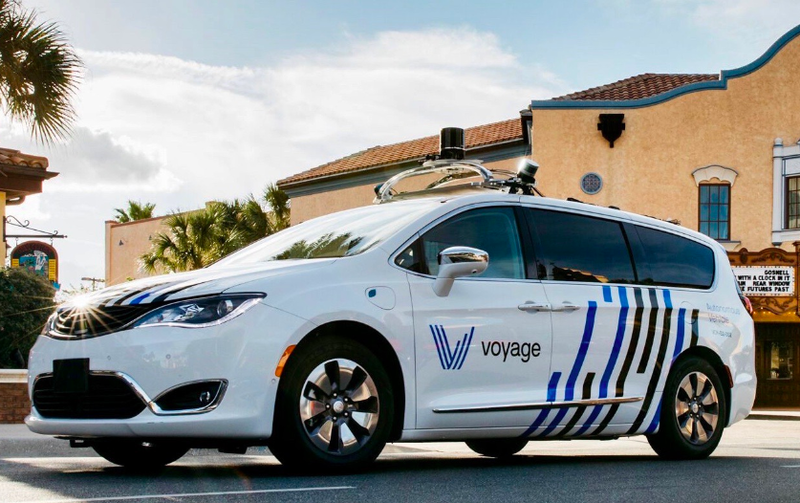 Voyage, a California company which is developing fully autonomous vehicles, is rolling out driverless taxi service in The Villages. Hayes was curious how the driverless taxis would get through the many gates in The Villages. “Will they have a gate card?” he asked. Hayes indicated that pushing the red button didn’t seem like an obvious way for a driverless vehicle to enter through a gate. “Are passengers responsible for bringing their gate cards?” he asked. Villager Sally Moss returns home after a ride in a Voyage self-driving vehicle. Villager Sally Moss took a ride in one of the taxis last month, but she traveled with company technicians aboard. Tom Hauburger, head of product development for Voyage, has admitted the hundreds of miles of The Villages, roundabouts and gates have presented the company with several new problems to solve. Gates in The Villages don’t prevent anyone from entering, as most of the roads are owned by the taxpayers, not just residents of The Villages.